I have always been fascinated by spiritual aspects of revolutions, maybe because my family come from the Sufi tradition, who knows [continues after video]. I have always been fascinated by spiritual aspects of revolutions, maybe because my family come from the sufi tradition, who knows.In #Sudan they believed that the Mehdi was sent from God to get rid of the colonisers he and his followers did just that, first defeating the Turco-Egyptian rulers and then British invaders.In #Cuba in 1959 after FIdel Castro's triumphant entry into #Havana after defeating the Batista dictatorship, white doves landed on his shoulders. Even though, Fidel was an atheist, legend has it that the local people (who were deeply religious) saw this as a sign that he was chosen by God and the dove represented hope for a forgotten people.In #Venezuela I visited the National Pantheon where Venezuela's independence heroes are buried and above the entrance hangs a painting that hung their before #Chavez came into power and was painted 35 years before Chavez was even born. In the painting is a little slave boy, that looks identical to Chavez, looking towards where Simon Bolivar was buried and with a cheeky Chavez like smile, some believe that this is symbolic of Chavez continuing the legacy of Bolivar and that it means Chavez was sent for that purpose. Chavez was also Latin America's first President to embrace his indigenous and African heritage which makes the slave boy an even more potent image symbolically. In #Sudan they believed that the Mehdi was sent from God to get rid of the colonisers he and his followers did just that, first defeating the Turco-Egyptian rulers and then British invaders. 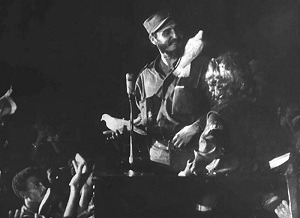 In #Cuba in 1959 after Fidel Castro’s triumphant entry into #Havana after defeating the Batista dictatorship, white doves landed on his shoulders. Even though, Fidel was an atheist, legend has it that the local people (who were deeply religious) saw this as a sign that he was chosen by God and the dove represented hope for a forgotten people. In #Venezuela I visited the National Pantheon where Venezuela’s independence heroes are buried and above the entrance hangs a painting that hung there before #Chavez came into power and was painted 35 years before Chavez was even born. In the painting is a little slave boy, that looks identical to Chavez, looking towards where Simon Bolivar was buried and with a cheeky Chavez like smile, some believe that this is symbolic of Chavez continuing the legacy of Bolivar and that it means Chavez was sent for that purpose. Chavez was also Latin America’s first President to embrace his indigenous and African heritage which makes the slave boy an even more potent image symbolically.